Hello all, sorry I’ve been away for so long – I’m sure you missed me (yeah right!). I was very neglectful in writing my blog last year but I hope to start doing some regular updates. My raised veg garden is in it’s third year and is still going strong. I put some new layers on in January, a thick layer of newspaper followed by a mix of homemade compost and shop bought multi-compost. This year I wanted to make the soil in the raised bed slightly heavier so it’ll be better for cabbages and other brassicas. They prefer firm soil to live in and I’ve found the multi-compost is just too fluffy and light. So in February, I bought four bags of top soil just to lay on top as this year’s final layer. Why buy soil when it’s literally everywhere? I hear you ask. Well, unfortunately, my garden is full of awful weeds like ground elder, horsetails, hairy bittercress, redshanks along with all the common weeds everyone gets. So the only option was to buy some decent weed free sterilised soil. I still have to weed it but it’s nowhere near as bad as growing my vegetables in the ground. For many years I have despised figs, their leathery outer skin and their gritty interior simply repulsed me. However, I put on a North African inspired party after Christmas (don’t ask!) and some of the dishes required dried figs as an ingredient. 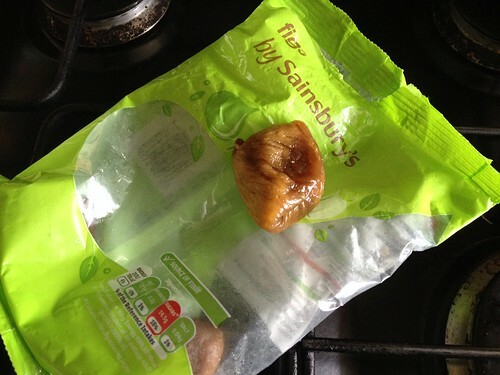 I so bought the figs and as I was preparing the meal, I thought I would just try one – well it had been 15 years since my last attempt! I bit a piece off, chewed it and….I loved it! Now I don’t know what’s happened, whether my taste buds have changed, whether it was a particularly delicious pack of figs, or maybe aliens have chopped off my tongue in the night and replaced it with someone else’s. Whatever it was, I am now a convert and love figs, so much so, I’m starting a fig experiment. 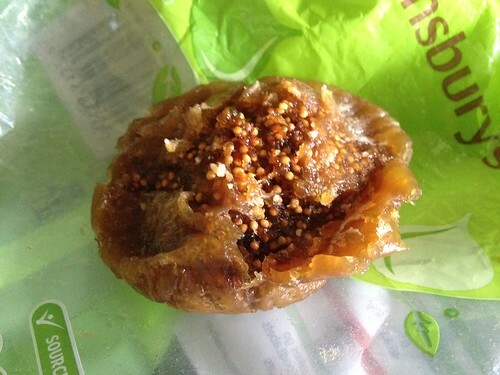 The dried figs I bought (as with all figs) are packed full of seeds. Being the frugal, get something for nothing person I am, I wondered if the seeds would grow. I have looked online and there is strangely very little information on this. What I have found is the common fig ‘Ficus carica’ is always propagated via rooted cuttings or by grafting. Figs are rather like with apple trees, a fig grown from seed is never the same as the parent. A fig grown from seed, as I said will be a new type of fig. It may be a wonderful new kind of fig, producing bountiful delicious fruits, however, more likely it will produce a disappointingly small fruit or perhaps no fruit at all. Whatever happens, it’ll be interesting an exciting to find out. There are a few discussions on various forums with people like me asking if it is possible to grow from seed but there are very few definitive answers. So now starts the experiment! I extracted some of the seeds from a particularly sweet fig as my thinking is that although the offspring won’t be exactly like the parent, it’s always good to have the best breeding stock. 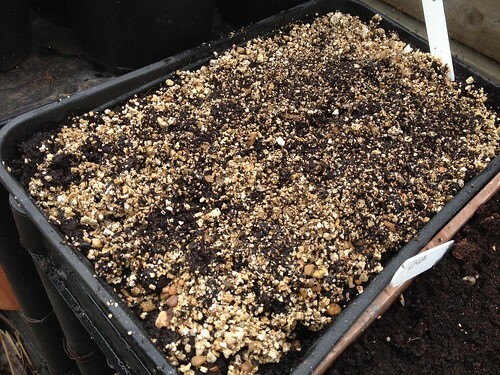 After eating the rest of the fig, I then soaked the seeds for a day and added them to a mix of vermiculite and compost. I did read one reference to growing from seed that they like a very damp environment, so I completely saturated the soil with water. Only time will tell whether I’ll be successful in growing anything but from what little I’ve managed to read, in ten days time, I may have something to report. Wish me luck! This entry was posted in Uncategorized and tagged figs, growing, seed. Bookmark the permalink.